Glebelands city growers is a haven of green lushness hidden behind a simple walk way between two buildings. The scenery is idyllic; a market garden perched on the banks of the River Mersey, the earthy smell of freshly tilled soil and sounds of chirping birds fill the air. A gentle breeze and the flowing river all but shut out the noise of traffic from the M60, isolating the farm from the hustle and bustle of Sale South Manchester. 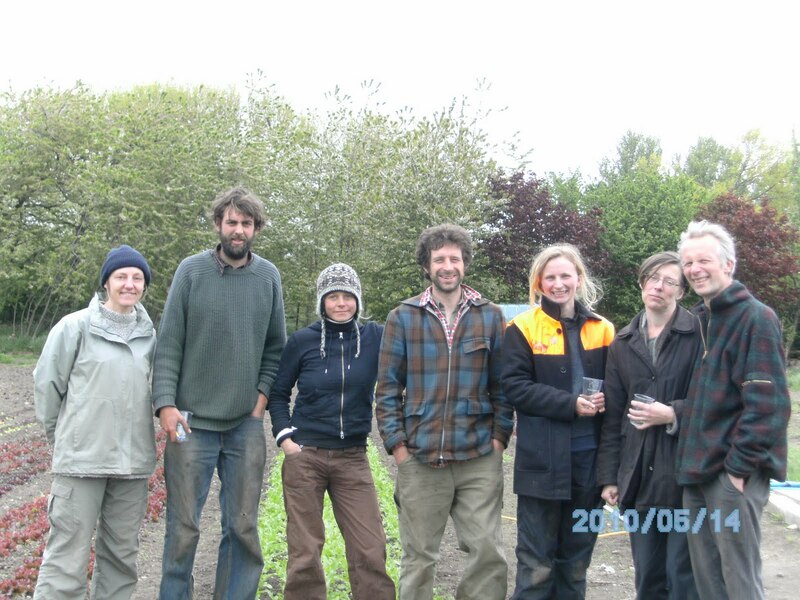 The land for the farm is on lease from the Trafford Metropolitan Council and the market garden is run by a friendly and dedicated four member strong team of Charlotte, Adam, Sally and Ed. They are helped by Emily, who has been volunteering on the farm for over a year. The team met through World Wide Opportunities on Organic Farms (WWOOF), a registered UK charity made up of an international network of organic farms, gardens, and small holdings which are called hosts. These hosts offer food and accommodation in exchange for practical help on their land which they farm using ecologically acceptable methods. Glebelands is certified by the Soil Association, a membership charity that campaigns for organic food and farming. The farm operates on the principle of feeding the soil rather than the crop and has a balanced ‘ecosystem’ approach to farming without the use of fertilizers or pesticides. Rows of polytunnels, a glass house and a green house filled with ready to plant seedlings, help ensure the production of leafy crops all year round. All produce – mainly vegetables – is sold within 5 miles of the farm. Composting is done onsite with additional plant inputs sourced no further than 5 miles. The farm has just one tractor, keeping mechanisation to the minimum. Most of the work done manually, which helps to significantly reduce the farm’s carbon footprint. Although the team members do admit that it is a lot of hard work, they are also quick to add that they find it rewarding and well worth it. Innovative irrigation systems applied on the farm comprise of buried pipes under the vegetable beds with tiny holes to ensure that the soil is properly irrigated with no water wastage. This is usually not the case with traditional sprinklers due to changes in wind direction. Plans are currently under way for a sustainable irrigation system that is to be served by the River Mersey. The farm’s steadily increasing clientele include Unicorn– Manchester’s Co-operative grocery a successful whole food UK outlet named The Observer Food Monthly’s ‘Best Independent Shop’ and Radio Four Food Programme’s ‘Best Local Food Retailer in 2008. Dig food box scheme a South Manchester home delivery service started in Chorlton but now moved to Altrincham. It specialises in locally sourced organic fruits and vegetables. Glebelands also supplies Organic North Wholesale, a co-operative formed by a group of organic businesses. Café Ark-Sale Water Park a vegetarian café located adjacent to the Mersey Valley visitors centre and Jam Street Café, Chorlton. In April 2010, the Glebelands City growers’ team began work on the ‘Grow for it!’ project an educational programme for local schools, being funded by the Big Lottery Fund’s Local Food scheme. Training and volunteering opportunities do exist on the farm as well; visit their website/ for more details. Forthcoming events include the “Open Farm Sunday” scheduled for the 13th of June 2010 and Community Volunteer Task Days that run throughout the year. There is a ‘Hoe down’ event coming up on Saturday 17th July 2010. The team hopes that community involvement would help raise the awareness of low carbon food production, which is an undeniable benefit of urban sustainable horticulture. Membership based organisations such as the Organic Growers Alliance (OGA) provide support in the form of workshops, forums, quarterly magazine etc to organic horticulture practitioners throughout the UK. The support helps overcome challenges such as land procurement, finding the market for the produce, funding, weather, crop failure etc. These challenges notwithstanding, market gardens such as city growers serve as not only a shining example of the successful practice of urban sustainable horticulture, but also remind us of where the food we consume comes from. I agree with Ed’s words ….. ‘We have all become far too removed from how our food is produced’. As I sit down enjoying a cup of tea and biscuits with the team, I am reminded of nature’s ever-nurturing capacity. This entry was posted in glebelands, Unicorn Grocery. Bookmark the permalink.